A couple weekends ago, the near-constant downpour we've had in DC subsided. The break was only temporary, but as the proud owner of a new herb garden, I'm telling myself it's good for the plants. With things breezy and clear for a couple days in a row, we decided to have some of our most favorite people over for Saturday lunch on the deck. I'd planned a low-maintenance menu of dishes I could prep in advance, then pull together relatively quickly when we got home from synagogue on Saturday. Macaroni salad with ramp pesto and pre-blanched asparagus. Chilled baked salmon (which I'll be telling you about soon, because it was delicious). And, of course, cold soup. I'm quite fond of cold soup as a concept. You make it, pour it into a jar, and then you wait. Wait until you need a weekday lunch; wait till friends come over and you want to serve them a little something; wait until, I dunno, you're hungry. You pretty much can't go wrong with a cup of cold, smooth soup on a warm day. If we're talking about soups with dairy in them, and if we're being particular, I prefer yogurt- and buttermilk-based soups to those finished with cream. I love how sweet pea soup become tangy and bright when you blend in some yogurt just before serving. And I love the bewitching flavor of this white gazpacho, which gets its tang from buttermilk. That weekend, I put yogurt to work in a serious way, whipping up two cold soups to serve at lunch. One was a pureed beet-yogurt soup, with dill, mint, and a pinch of cumin. The other was a curried yellow squash soup, also blended smooth. I'd planned to give folks a choice of either soup, but when I set them next to each other on the counter, the color contrast was so striking that I decided to serve them side by side in the same bowl. 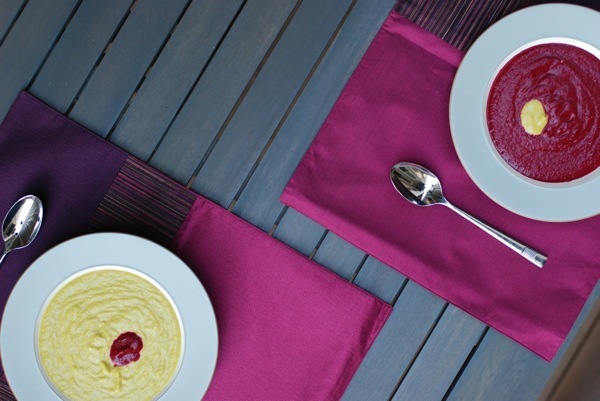 As you can see, the gemlike fuchsia beet looked just gorgeous next to the bright mustardy yellow squash soup. Conveniently, their flavors also complement each other. The beet soup is a bit sweet and very herbal, while the squash soup is deeper and slightly saltier. They're a perfect pair. Make one, make both. Store them in jars in the fridge until hunger strikes. I've found that they keep at least a week with no problem, maybe more. If you're feeling fancy, top the bowls with a cut of fresh chives or even a dollop of - yep - yogurt. Hope everyone has a wonderful long weekend. I'll see you back here next week. Cook beets unpeeled, wrapped in foil, for 50-75 minutes in a 350-degree oven until a knife pierces easily through the flesh. Cool completely, then remove their skins. I find it's easiest to do this either under running water or - more environmentally friendly - submerged in a large bowl of cold water. A bit of rubbing, and their skins should slip off. Some may take more elbow grease than others; if the skin really insists on staying put, you can always use a peeler. Cut beets into chunks, and transfer to a blender. Add remaining ingredients, and puree until completely smooth. Transfer to a jar and refrigerate until ready to serve. Put the butter in a large pot and set over medium heat. When butter has melted, add onion, curry, cumin, salt, tumeric, and cayenne, and cook until onions have just begun to soften and spices are fragrant, about 5 minutes. Stir in squash and cook an additional 5 minutes, until squash has softened. Add 1 cup water, reduce heat to medium-low, cover, and let simmer until squash is fully soft, about 10 minutes. Let cool completely. Add squash mixture, yogurt, and basil leaves to a blender and puree until completely smooth. Transfer to a jar and refrigerate until ready to serve. If planning to serve both soups together, simply hold 1 jar in each hand, and pour into the bowl simultaneously. The soups should fill the bowl at the same time, forming neat semicircles in the bowl with a clean equator. If not, no stress. You might even take a knife and make circular motions in the bowl to give the soups a spiraled, swirled effect.